Vanus Creations | Can Facebook Ads Help an Exterminator? Can Facebook Ads Help an Exterminator? At first blush, it doesn’t seem to make a lot of sense for an exterminator to project a youth-friendly brand. You never see bug killers advertised on MTV, and it’s unlikely that Orkin will tap Justin Bieber as its next spokesman. Yet an outreach towards the 18-34 demo seems to be paying off for Bug Out. When we last left Bug Out, the Anaheim, Calif., exterminator was pledging to spend up to $1,000 on Facebook and Twitter ads. A month later, the investment seems to have paid off — at least on Facebook. On that platform, the brand went from 135 fans to (as of July 29) 636, an increase of 501. Bug Out spent about $1.75 per Facebook fan. Though much of that progress came as a result of the ad spend, Bug Out also got consulting help. As with previous Social Makeover stories, we hooked up a small business with a social media expert from our Small Business Panel to see how their advice plays out in the real world. In this case, the expert was Blagica Bottigliero, the principal behind Zlato Digital, a digital and social media marketing firm. 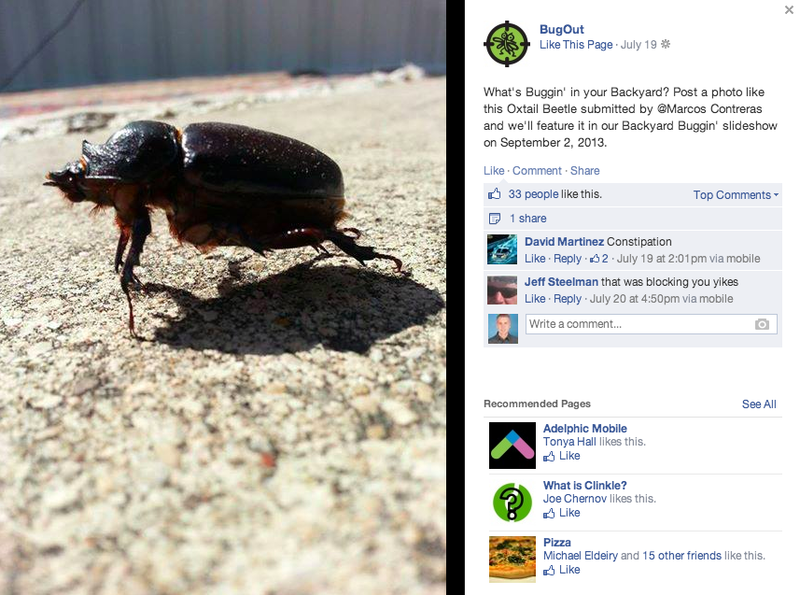 One popular recurring feature is “What’s Buggin’ in Your Backyard?” Those posts, which are amplified via ad buys, yield lots of insect pics, which prompt strong reactions. “Bugs are very emotional,” says Austen-Lewis who says these posts result in impressions that “go through the roof.” It’s not all idle chatter, either. In the period since our initial article, Bug Out’s leads via social media have risen 30%. “That’s huge for us,” she says. Twitter is another story. Bottigliero had suggested a 70%-to-30% breakdown in Facebook/Twitter ad spending. Actually, the ratio was more like 85/15. Bottigliero noticed that, compared to Facebook, Bug Out’s Twitter presence is still pretty flaccid. Austen-Lewis acknowledges that Twitter is still a big mystery. “Twitter is a game all to itself,” she says. “It’s magic you have to create in 140 characters.” Bug Out hasn’t been able to do that yet and its ad spending on the platform didn’t do much to help things.